Info "Cook both of the dumplings." 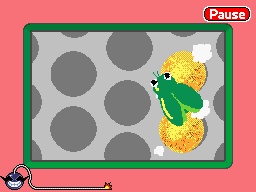 Cooking Bug is one of Ashley's microgames in WarioWare: D.I.Y. The point of the game is to cook both of the dumplings at the same time. However, there is a fly that constantly hovers over the dumplings. Tapping the bug does nothing, but prevents the player from cooking that dumpling. The player needs to tap each of the dumplings once. This should mean that both of the dumplings look alike. Tapping a dumpling twice without tapping the other one has no effect. After the dumplings are tapped once more, the game is won. However, if time runs out and the dumplings aren't made, the game ends in a a loss.